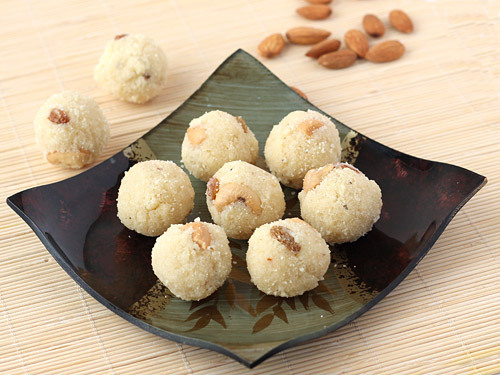 Festival celebrations come alive when delicious rava laddu prepared with coconut, saffron and dry fruits is served. 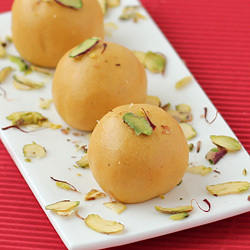 It is a traditional Indian sweet suitable for all occasions and festivals. Learn how to make best ever rava laddus at home with this easy recipe. Take a thick-bottomed kadai and heat ghee in it. 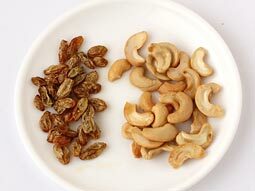 Fry the cashew nuts until light brown over low flame. Drain and transfer to a plate. Fry raisins in the same ghee until they puff up, drain and transfer them to the same plate. 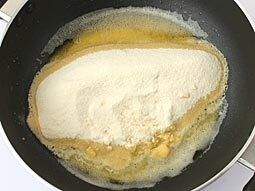 Add rava in remaining heated ghee in the same pan. Roast it until its color changes to light brown and fragrant smell starts to come over low flame. Turn off the flame and transfer to a plate. Allow it to cool at room temperature. 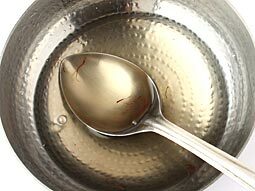 Heat water and sugar in the kadai over medium flame and stir continuously until sugar melts into syrup (chashni). Add saffron strands. To check whether its “one string” consistency or not, put a drop of syrup on a plate or a small bowl and cool it by blowing air on it. 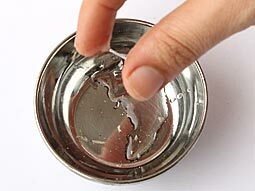 Take a pinch of sugar syrup between your thumb and forefinger, pull them apart and check if single strand is formed. 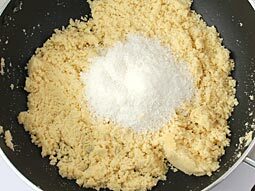 Slowly add semolina-shredded coconut mix (prepared in step-3) in syrup and stir continuously to avoid lumps. Turn off the flame. Add cashew nuts, raisins and cardamom powder and mix well. Allow it to cool at room temperature until warm enough to handle. Divide it into 15 equal parts and give them a shape of ball (laddu) with your palms. Rava laddus are ready. Either serve them immediately or store in an airtight container to enjoy it at anytime you like. Follow the given steps to make them without preparing sugar syrup (chasni). Follow the steps (1 to 4) as given above. Add 3/4 cup powdered sugar, cardamom powder and dry fruits; mix and cook for a minute. 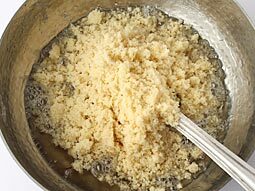 Add 2-3 tablespoons warm milk in small incremental quantities (start by 1/2 tablespoon) and keep mixing it until ladoo mixture is soft enough to form small balls, it will take around a minute. Turn off the flame. Let the mixture cool for 5-7 minutes and then make small balls from mixture. *Make sure, sugar syrup is not cooked for long duration, otherwise mixture turns hard after adding roasted rava and you are not able to make laddus. If it happens, add 2-3 tablespoons of warm milk little by little, mix well and prepare small round shaped laddus from mixture. You can avoid coconut if you do not like its flavor. Make sure that rava is roasted properly. Improperly roasted rava will make sticky laddus. Taste: Sweet taste with nice flavor and aromatic fragrance of cardamom and saffron. Serving Ideas: Serve them with dry snacks like gathiya, crispy puri, chivda, etc. Sweet lovers would like to have it alone at any time of the day. Hi, Wish you a Very Happy & A Sweet Diwali. Thanks for this recipe. It's really good. Tried this one yesterday. It came out very well. But we are used to much less of sweetness. Can I use little less quantity of sugar. Say 1/2 cup. In that case how much of water should I add? Also the laddoo was dry and difficult to roll into laddoo yesterday. Today it became perfect consistency after soaking perfectly. So if I still lessen the sugar syrup will it be difficult to roll into laddoos? 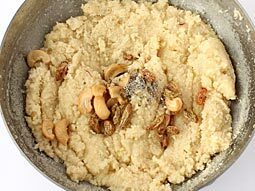 Response: Hello Purnima, if you want to use less sugar, then make the "rava laddus without sugar syrup" (as given in the recipe before the tips section) for perfect laddus. Wonderful recipe....Happy with the result....thank you very much....!!! What's the shelf life of the ladoos? Response: Laddu stays good for 8-10 days in an airtight container at room temperature. Really good recipe. Sugar syrup should be made as instructed ! If we over cook then the mixture will get dry. But even if it gets dry sprinkle little Milk as required to prepare laddus that's what my wife did and there were really yummy laddus. I would rather use 1/2 sugar instead of 3/4 as I don't like too much sweet confectionery items. And I didn't use dry fruits as I like plain laddus ! Thanks thanks thanks foodviva a lot! We are preparing today. Thanks for the recipe. Hi....nice recipe...do we use any particular rava...used rajdhani suji...it seemed a lil hard while eating....also for how many mins do we roast suji...do we have to add suji after getting 1 string consistency or when it is about to happen...thanks. Response: Hello Rashmi, you can use any brand's super fine rava for this recipe. Time for roasting the rava (suji) depends on the thickness of kadai (pan), gas flame etc. When you roast the rava, stir it continuously and roast it over low flame until the color changes to light brown and nice fragrance start to come. You can add the sooji in sugar syrup when the 1-string consistency is about to happen. 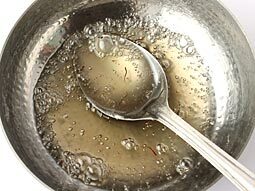 Hi, Can sugar syrup be made with palm sugar or candy? Response: Hello Shantha, I have never tried palm sugar to make the sugar syrup for this laddu, so I am not able to answer. I tried this recipe without adding sugar syrup but by adding powdered sugar. But however after adding milk, rava is crunchy and not soft. Rava seems to be not boiled. Should I first add milk and then add sugar. I am clueless why it went wrong. Response: Hello Suma, the texture of rava in rava laddu should be crunchy and not soft like halwa. The milk is added in little quantity and only for the binding purpose, so the rava stays crunchy. Hi Foodviva, thanks a lot for this yummy recipe. I tried it and did it perfectly. I followed the accurate measurement and procedure. I liked it very much and my family members too. Response: You are welcome Merina. Glad to hear that your family members liked it. Hi food viva, I tried the recipe but somethin went wrong, after cooling to room temp, I could not make ladoos, I know it is due to overheating sugar syrup, I like to know how many minutes I have to heat the sugar water solution and flame of the gas should be high or medium or low. Response: Heat the sugar-water mixture over medium flame and stir continuously with a spoon. When it starts to turn little sticky, add the rava and mix well and turn off the flame. It will take around 5-7 minutes to reach the 1-string consistency (depending on the flame and thickness of the utensils you have used). Hi, can I use wet shredded coconut or maybe a pate of it in place of dry coconut? Response: If you add the wet coconut (fresh), shelf life of laddu will reduce. So, keep the laddu in the container in refrigerator. Hi, I made rava and besan ladoos from your recipes. They came out really well, only thing is in rava ladoos, mixture was very dry and I had to put little little milk and made ladoos. But they were very tasty. I just wanted to know where I went wrong. Do we have to close the lid after putting sugar syrup? Response: Hi Dhanlaxmi, thanks for trying the recipes. The reason behind dry mixture is the over cooked sugar syrup. If the syrup is cooked longer after reaching the single thread consistency, it happens. Very nicely explained recipe. I was making for the first time and was worried if I do some mistake. I followed the exact measurements & procedure mentioned and they came out to be really yummy laddoos. I am so confident now to make rawa laddoos independently. Thank you foodviva! It really awesome, taste is good. Thanks. I made rava laddu following food viva recipe. I made without using sugar syrup. All the ones were finished within no time. My 1.5-year old son was the best consumer. Now I am a big fan of foodviva. I do not follow any other sites at all. Response: Thanks Helen, I'm glad your son liked the ladoo. Hi, can you tell me 3/4 cup sugar means how many in gram? Response: 3/4 cup granulated sugar equal to 150 grams (approx. value). Hi Samira, I would suggest you to buy measurement cup set for perfect measuring the ingredients because some ingredients are difficult to measure in grams. Follow our cooking measurement guide for common ingredients cup and gram conversions. Does it stay good for 3 days? Do I need to store it in the fridge? Response: Hi Gowri, it stays good for 8-10 days in an airtight container at room temperature. I just came across this recipe and thought of trying it as I am a big fan of Rava Laddoos !! 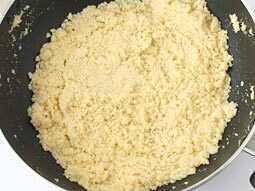 However, I was wondering - can I use dry coconut powder instead of the dry shredded coconut that you have specified in your recipe? Would it turn out good? 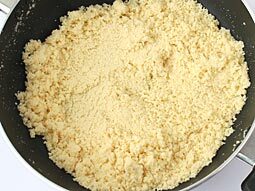 Response: Hi Tejaswini, you can use the coconut powder in place of dry shredded coconut in this recipe. Fantastic recipe. Very tasty. Thanks.